Built 1908 by Eduard Prandl. Named in honour of the Austrian composer, Johann Strauß jr. (1825-1899). Opened 31 Oct 1908 with the operetta, "Tausend und eine Nacht" (= Johann Strauß's "Indigo" with a new libretto). 1192 seats. 1931 converted to a cinema, renamed "Scala". 1948 renamed "Neues Theater in der Scala" and again used as a theatre proper. Closed 30 June 1956. Demolished 1959. 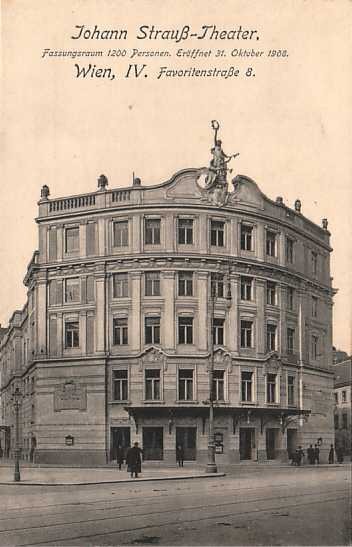 Front Text: "Johann Strauß-Theater, Fassungsraum 1200 Personen, Eröffnet 31. Oktober 1908. Wien, IV. 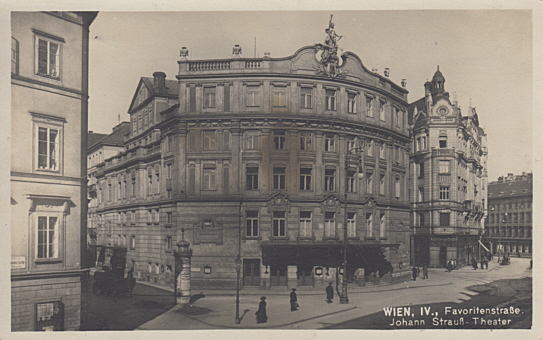 Favoritenstraße 8"
Front Text: "Wien, IV, Favoritenstraße, Johannn Strauß-Theater"